If you are a registered voter in south Reston, there is a good chance a sample ballot sent to you by the Fairfax County Office of Elections is incorrect. Voters on Friday received official election mail from the county in advance of the Nov. 8 general election. The information for president, the meals tax, and on Virginia constitutional amendments and bonds is correct. The ballot for the U.S. House of Representatives is wrong. 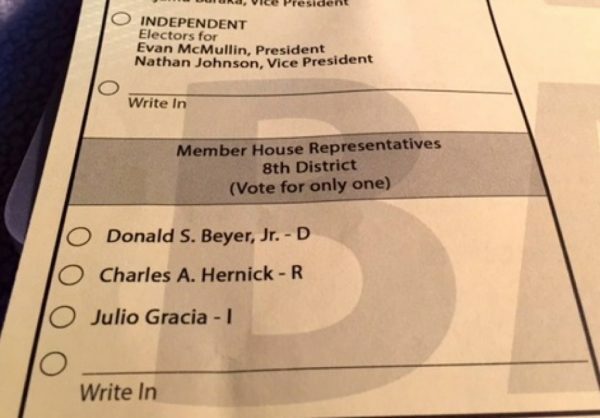 Voters in five precincts in the South Lakes-Hughes-Hunters Woods area received sample ballots with information for Virginia’s 8th District, where Rep. Don Beyer (D) is seeking re-election against Charles Hernick (R) and Julio Gracia (I). Those precincts are in Virginia’s 11th District, where Rep. Gerry Connolly (D), is running unopposed for re-election to the House. Reston was a member of the 8th District for 20 years, returning to the 11th in Virginia’s 2011 redistricting. Anyway, consult a correct sample ballot on Fairfax County’s website.